Counter-cultural to the perception that with age comes weakness and wrinkled beauty, today I saw with my own two eyes, the TRUTH. The truth was, that at 4 months postpartum, I was in a core-strengthening fitness class and I was struggling. 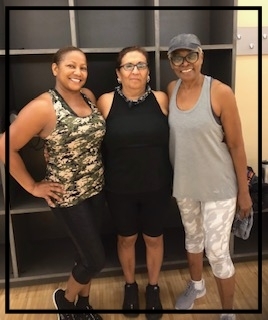 As I looked around the room I saw women of a much more mature age and they were killing it; their balance was impeccable and their endurance throughout the entire class was phenomenal. 56, 62, & 70 years beautiful! But, the truth is that I couldn’t and my age had nothing to do with it. As I continued through the class I realized that part of my challenge was indeed my physical limitations but a lot of it was also my mental fortitude. I felt weak in my mind; I began to doubt myself, and as I stared into the mirror I saw my lack of balance and I questioned my beauty. But as I looked over at these women ages 56, 62, and 70, I saw their beauty. Their beauty was revealed beyond the wrinkles. Their beauty was revealed beyond the curves and a few cellulite dimples here and there. Their beauty was revealed beyond the gray of their hair. Their beauty was revealed in the strength their character, working out on a regular basis, and being committed to doing the work! When I spoke to these women they encouraged me of course they said you just had a baby, your weakness it’s to be expected. They shared about their diligence in attending the classes and other fitness programs five days a week, and they revealed that their bodies aren’t perfect: they’ve had surgeries and aches and pains but it was their character of continuing to stay strong and strong in their minds that allows them to stay fit and to develop a beauty that goes beyond what the outside can see. So many of us know that we are not judge a book by its cover. We know that beauty is only skin deep. We know that age is nothing but a number. But do we really live out and exercise our minds to not only think the truth but to actually live in that which is true? So, my confidence and character challenge to you is to consider the ways in which your beauty is being revealed as you develop the character of mental fortitude and physical endurance. Shop this racerback tee in our online boutique for your next workout.